What a great meet!! We had a ball!! A superb location, a superb turnout and a great itinerary of events for the Club membership. Greenville, SC has certainly grown up since I lived there around the turn of the century. I was lost on almost every street we took. The downtown has been transformed with cobbled streets, quaint gas lights, and gardens and trees aligning main street. A plethora of shops, cafes and other delights were in place and we had numerous opportunities during the weekend to stroll and enjoy the sights. The only challenge we had was parking. No different than any other busy downtown. The Spring Meet turn out was quite good and I was amazed at the variants of Morgan cars. Series 1, 4/4s with Lotus Twin Cam, CVH, 1600, Plus 4 2 Strs, 4 Strs, DHCs, Flat Rads, Aero 8, Roadsters, Plus 8s and even Joe Speetjens in his Corvette powered Plus 8. Lots of oohs and aahs and lots of tires to kick. I think I counted 17 cars but might have missed one or two. 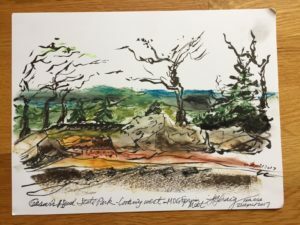 Saturday morning was a drive through the twisty bits to Ceasars Head State Park and then to lunch, a short drive away, at the Hotel Domestique. Wonder drives, views and it was great to top it all off with as superb lunch. Then back down the mountain and more exploring in and around Greenville. Sunday came with a threat of rain, but we didn’t really get hit, heading south for Florida. We heard others, heading north and west, did get a downpour. Well, no amount of rain could put a damper on the meet. ‘Job Well Done’ to the Leos (Andy and Anne) and the Buckleys (Pat and Judy) who organized the event!! Be Safe Out There !! Yesterday I posted some words that may have caused some concern about the availability of new Morgans in the US in the near future. The main premise of my post was that, based on information obtained from sources I believe to be credible, they speculated that the MMC might not have the motivation to produce cars for the US. It was thought that producing cars for the US would necessitate changes in the MMC production rates and methods and these are seen as challenges. I have been subsequently been informed, by additional credible sources, that the MMC is not really concerned about production challenges at this point in time. In reality, it is all the prerequisites – the legal details necessary to allow Morgan imports to the US – that have yet to occur. And, the MMC does want to have a US market in the future. So bottom line, regardless of their motivation at the moment, the MMC hands are tied. We can only really speculate when and if, once all the details regarding the laws are resolved. As this has yet to happen, we can try to accelerate the US Government’s actions by notifying our congressional representative of our desires. New 4 Wheelers in the US? – Not Likely Anytime Soon! All of us in the US have been following closely the new regulations that allow Morgan to create cars for import into the US. Some of us have happily placed orders and paid deposits to the dealers. The rumors had been at least new Roadsters would find their way to the US. I have to believe this is still possible but . . . I am not the only one skeptical. The Morgan blog thinks otherwise as the MMC is currently at production capacity and selling everything they produce, now, without the US cars. It’s a question of their motivation. And, it doesn’t appear to just be just the bloggers and their speculation. They are talking the MMC management directly and drawing their conclusions from these discussions. Some quotes from the blog. “I talked to [MMC Management] about this very issue earlier in the year. No real interest in filling the [US] orders. “Production is at capacity, without adding an extra shift to extend the working day they cannot make more…and to do this would require a major change to the organisation of the production side of the business. Hopefully, we are all wrong, and new cars will come to the US in the coming months, however I am not holding my breath. CLOSE Brothers Technology Services has been awarded the contract to finance the technology infrastructure upgrade at Morgan Motor Company’s Malvern headquarters. The work forms part of a strategic technology refresh project aimed at ensuring the company is well positioned to continue to produce its cutting-edge cars at its 100-year old factory and prepare it for future business demands. The systems which will be deployed as part of the contract will focus on cloud-based integrated systems and improving the mobility of the company’s employees to boost and improve its already outstanding customer relations. 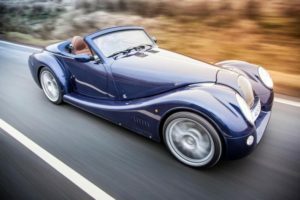 Ian McVicar, chief executive of Close Brothers Technology Services, said: “Morgan motor company already had a strong relationship with Close Brothers Motor Finance and approached us to help finance technology that not only met their requirements today, but also set them up for future success. Registration for the M3W Convention in May is Now Closed. As of 8 April 2017, registration for this event is closed. The response has been overwhelming and the attendance should exceed 60 folks and 25 cars. Thank you. THOUSANDS of Morgan cars will be returning to their home town of Malvern this summer for a very special event. Morgan Motors and the Morgan Sports Car Club have joined forces for Run For The Hills 2017 at the Three Counties Showground, billed as an event not to be missed by fans of the hand-made cars. The event promises to be the biggest gathering of Morgans since the company celebrated its centenary in 2009. Run For The Hills promises two days and nights of live entertainment, Morgan themed events, trade stands and much more. It will include tours of the Morgan factory in Pickersleigh Road, where visitors can explore the history of the family-owned British marque, from the first three-wheelers built in 1909 by founder H F S. Morgan, through over a century of innovation and craftsmanship to the modern high-performance Aero range. There will also be a gala dinner, and the weekend will finish with the English Symphony Orchestra headlining the Morgan Prom Spectacular, with a firework finale set against the backdrop of the Malvern Hills. Steve Morris, Morgan’s managing director, said: “Run For The Hills is a wonderful opportunity to celebrate everything that people love about Morgan. Whether you have a Morgan in your driveway or just a poster on your wall, Run For The Hills is for all enthusiasts. A range of ticket and accommodation packages are available including single day tickets, gala dinner tickets, weekend tickets and concert tickets. For further details, visit morgan-motor.co.uk/runforthehills. Selling Manifold and Holley Carb for +8 !! I brought the intake/carburetor back from North Carolina to Naples. The intake is an Offenhauser dual port. The Holley carb doesn’t appear to have any print on it to tell me what it is. It’s a 4-barrel with a electric choke. Perhaps between a 550 cfm to 650 cfm. I can’t find any comparables by which to price it. $200 seems fair. I took this off my 1969 +8 about 15 years ago.